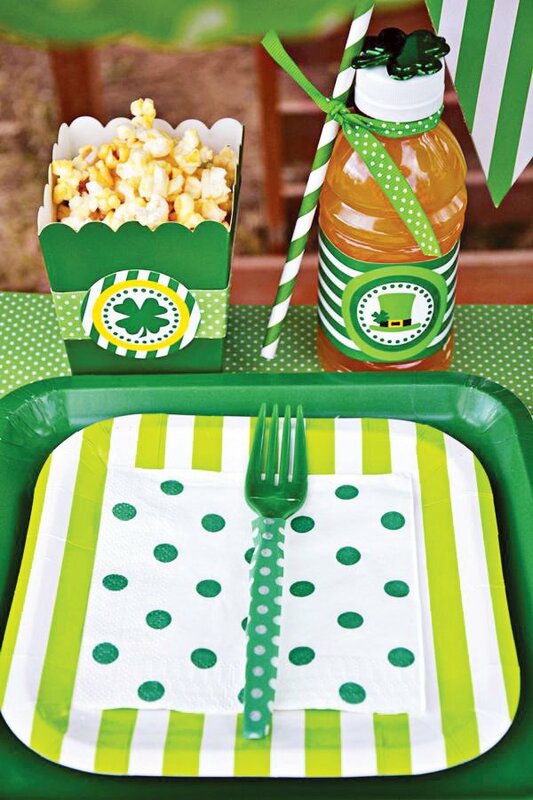 With St. Patrick’s Day right around the corner, now is the time to start planing your get together! 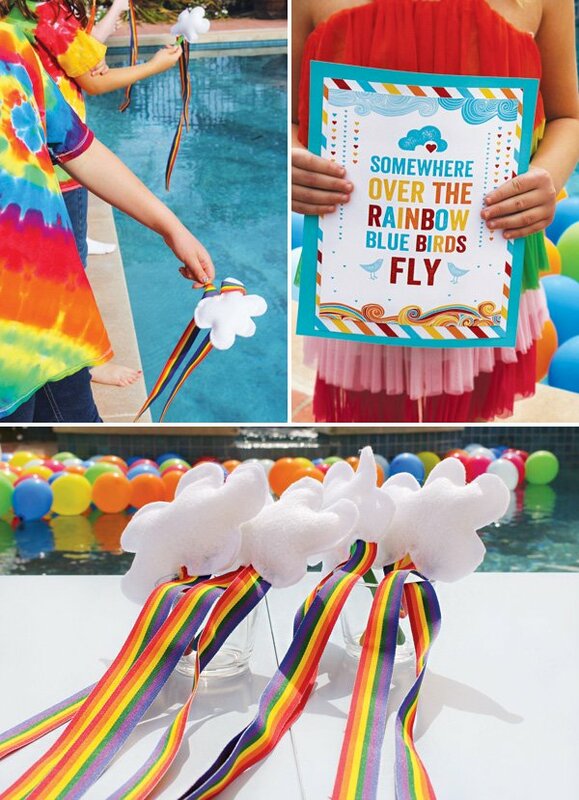 Amanda’s Parties to Go and I teamed up to help make the festivities easy and fun for you! 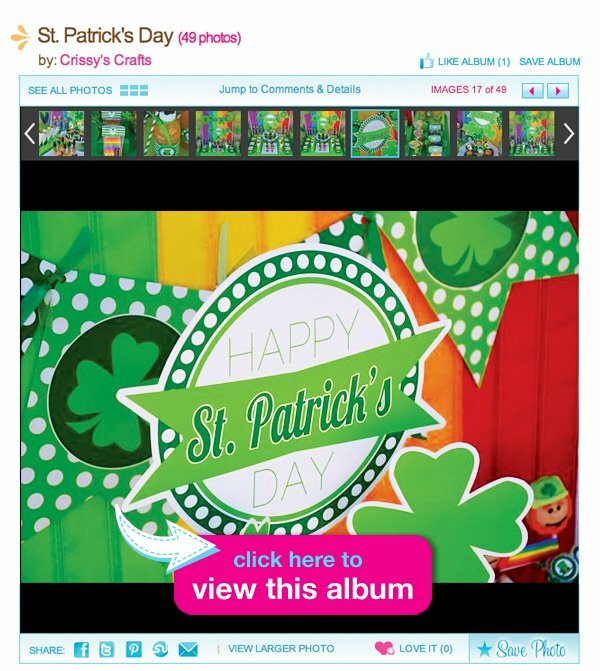 Amanda is offering a FREE St. Patrick’s Day Printable Set that made this party a breeze to style. 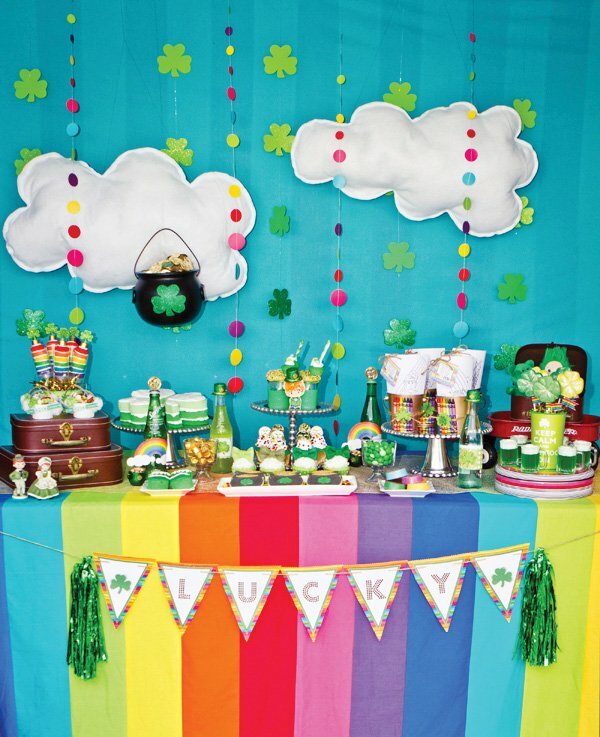 I created a colorful sweet/snack table for the kids with a rainbow backdrop made out of ribbons where I displayed the banner from the set. 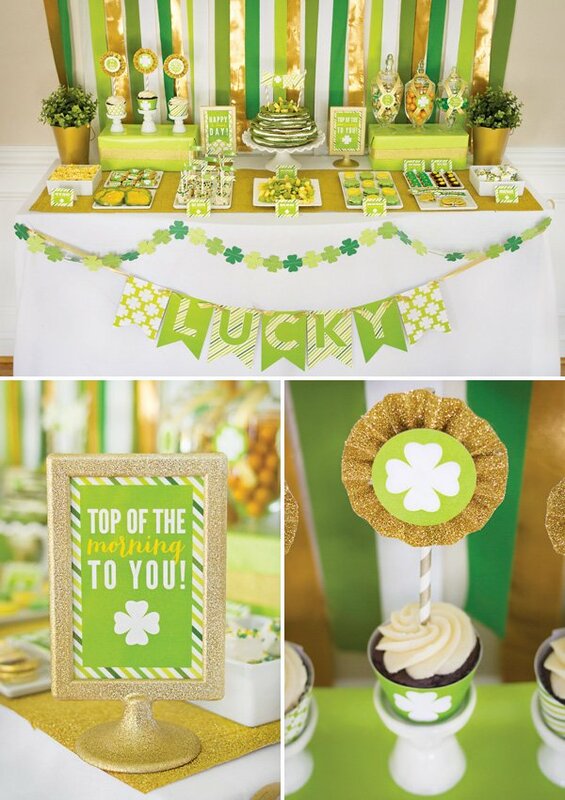 I used the icons from the printable set to create the center pieces for the the sweet table and the kids table. 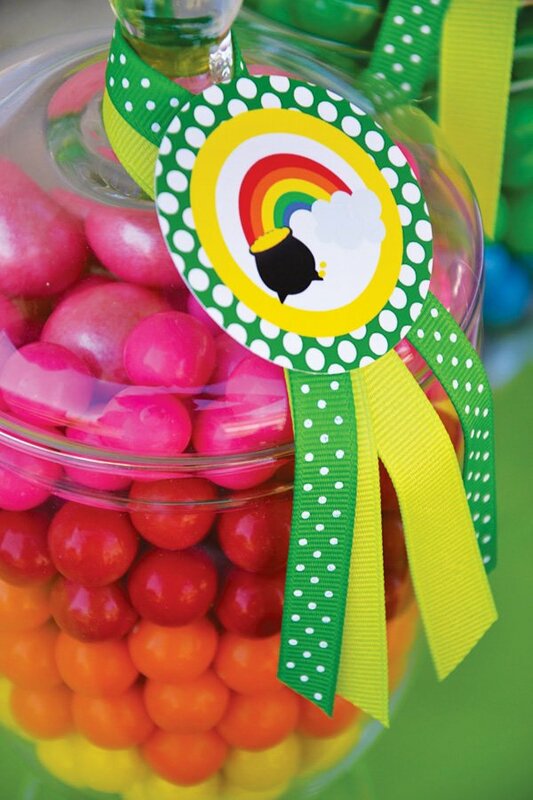 I dressed up the candy containers using ribbons and the circle tags included in the set. I also used the tags to embellish the popcorn containers. 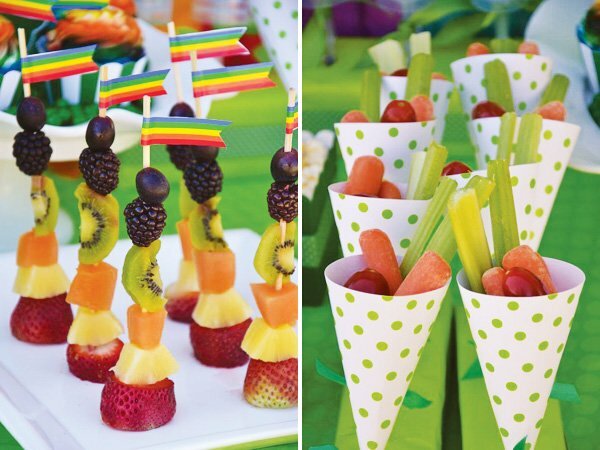 The rainbow flags were added on the kabobs sticks and lollipops for an extra pop of color. 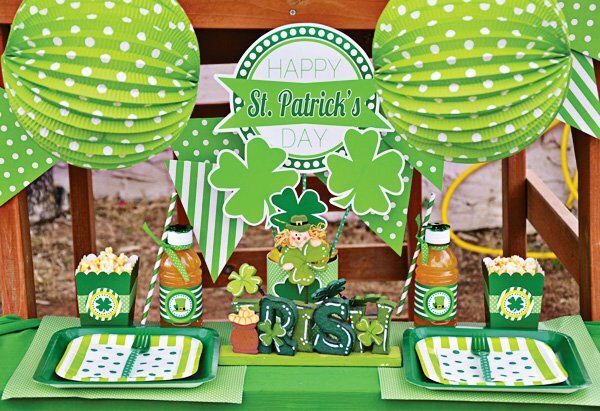 As for healthy snacks, the guests enjoyed leprechaun whole wheat sandwiches, rainbow fruit kabobs, veggies and orange juice. 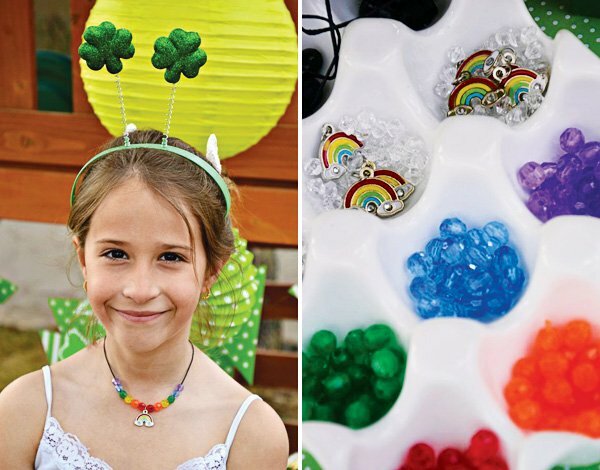 After their lunch, the children had fun making rainbow necklaces and finding gold coins around the backyard. It was finally time to enjoy some sweets! 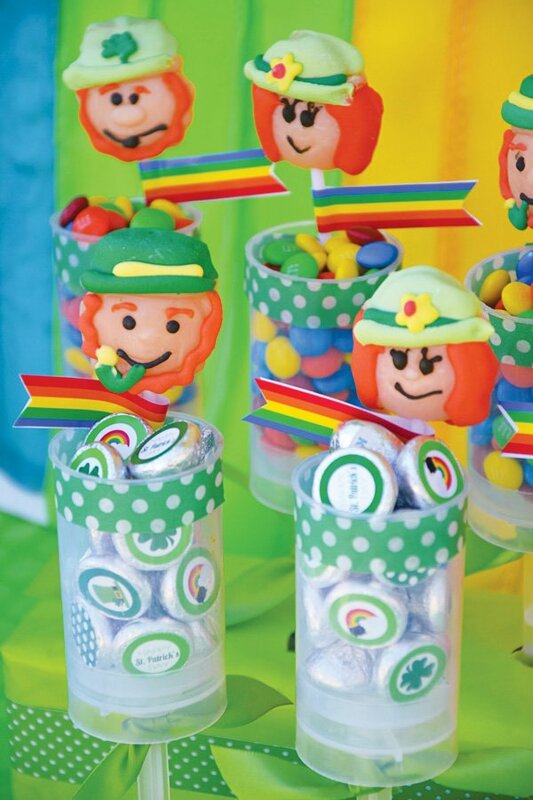 Rainbow cupcakes, M&M’s, Hershey’s kisses, lollipops and cinnamon popcorn were enjoyed by all! 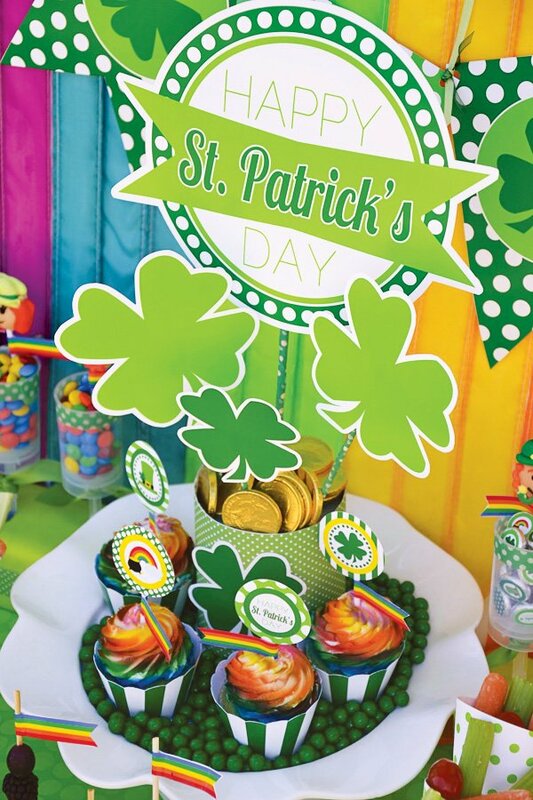 Instead of the traditional rainbow and pot of gold favor, I created a cute favor by dressing up green pails using cupcake wrappers, filling them with gold coins and finishing up by adding a rainbow lollipop. 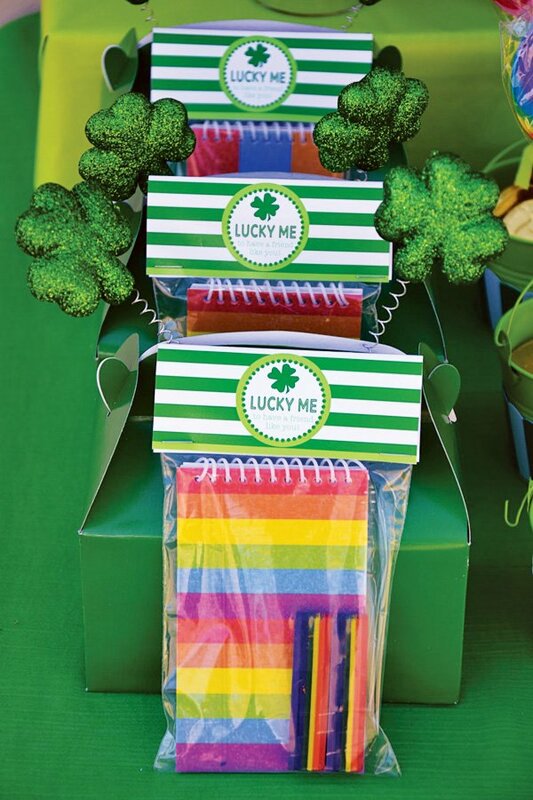 Each child also took home a rainbow notebook, rainbow crayons, shamrock necklace, shamrock headband and tattoos. 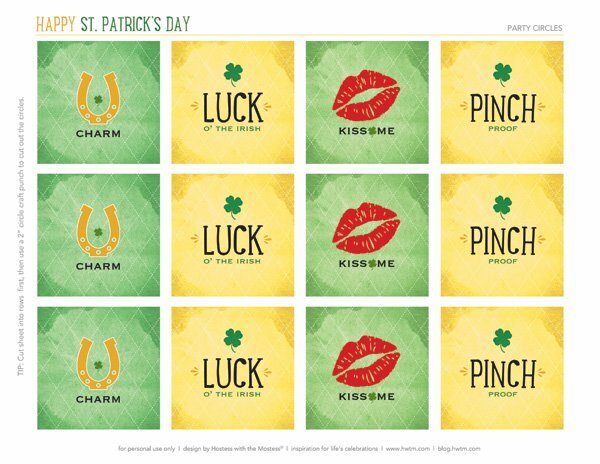 Hope these ideas and the FREE printable set offer help you plan your own St. Patty’s Celebration! 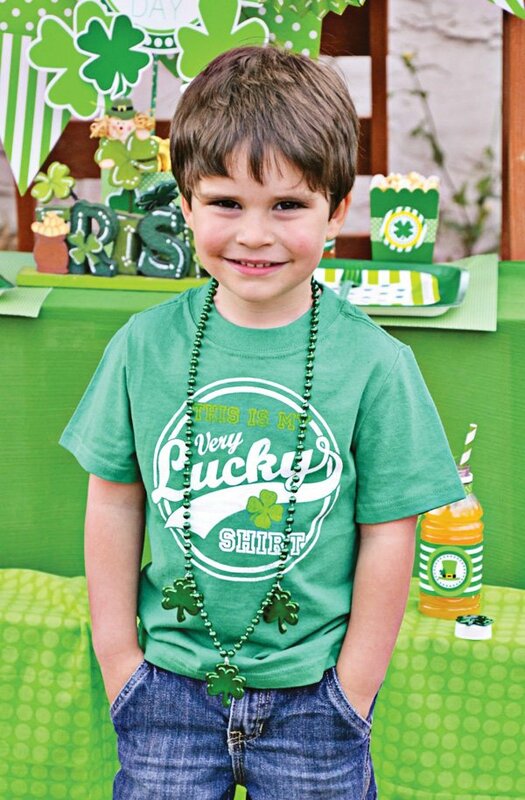 The St. Patrick’s Day Printables set includes lots of great printables like a banner, centerpiece sign, cupcake toppers, drink flags, treat bag toppers, drink wraps and Hershey Kiss circles, too. No wonder all the smiles! 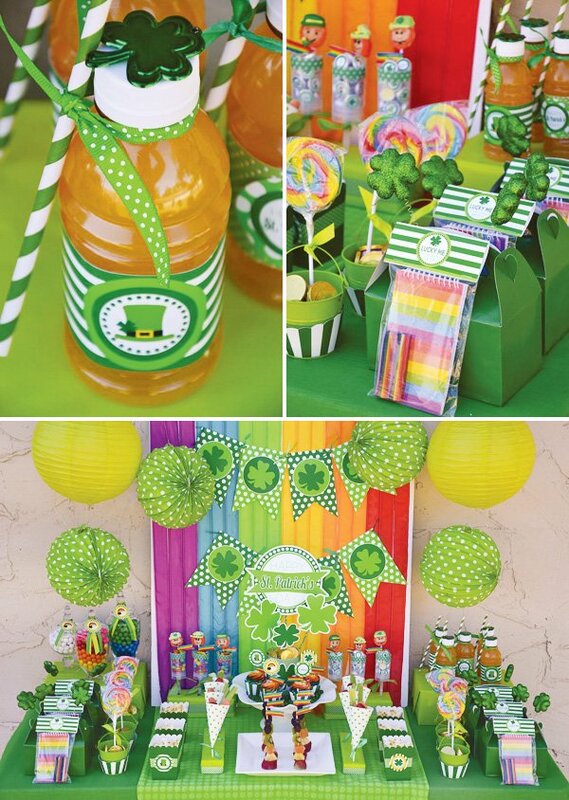 This is one super-cheery party scene! 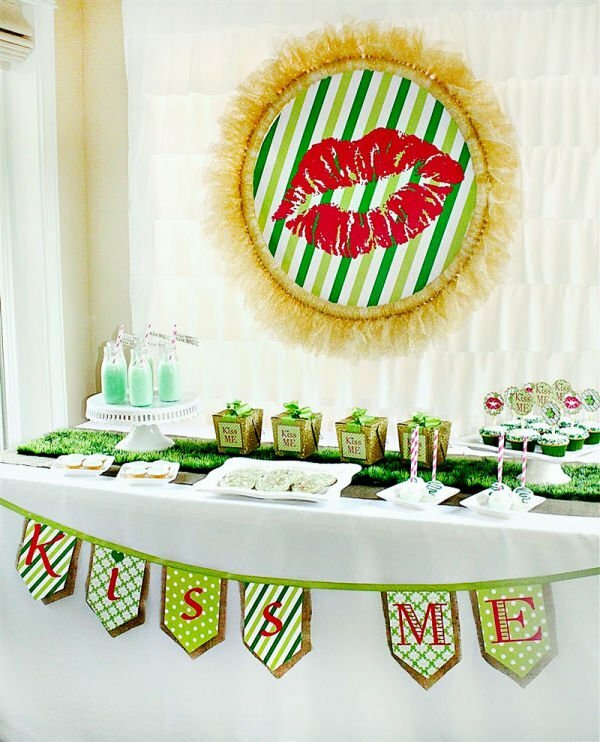 I used your theme for my party yesterday and everything was a huge hit. Thank you so much for this!